we make the weird happen!!! One of the world's most endangered primates has been caught on camera by scientists on the island of Borneo. Using time-lapse recordings to investigate the diversity of the remote Wehea forest, the team were surprised to see an unusual sub-species. Close analysis confirmed that they had photographed a group of Miller's grizzled langurs. Fears for the monkeys' future were sparked last year when none were recorded in previously known habitats. The international team of researchers suggest their evidence could indicate a more optimistic future. "Our findings confirm that indeed this monkey still lives in the forests of Borneo and we found that its range extends farther inland than scientists had previously thought," said PhD student Brent Loken from Simon Fraser University, British Columbia, Canada. "This gives us hope that we may still be able to find large enough populations of this monkey to ensure its survival." The team's findings are published in the American Journal of Primatology. Populations of Miller's grizzled langurs were first described in Kutai National Park and Sangkulirang Peninsula, East Kalimantan, Indonesia, in 1985. 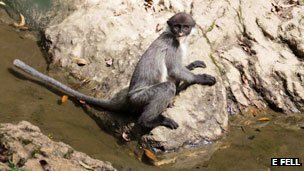 However, due to habitat loss and hunting, subsequent studies recorded falling numbers of the monkeys in these areas with no activity recorded last year. Scientists from Indonesia, the Czech Republic, US and Canada worked together to set up hidden cameras so they could learn more about the animals living in the rainforest. 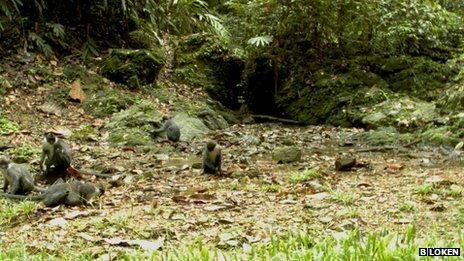 Stunned by the results of their initial camera-trap study, scientists returned to the location to photograph the little-known monkeys in greater detail. "It was a challenge to confirm our finding as there are so few pictures of this monkey available for study," said Mr Loken. "The only description of Miller's grizzled langur came from museum specimens. Our photographs from Wehea are some of the only pictures that we have of this monkey." some scientists found the worlds smallest monkeys who are almost extinced.